I am happy to present the “working,” schedule of events. Arthur will be performing at 3PM but will be present through the day, at his booth in the Greeting area, for conversations and browsing of the new CDs. A few of the Sensua Drummers will be leading up to ritual and then participating in the ritual, lead by Melanie McElroy, and then their main performance will be after ritual. 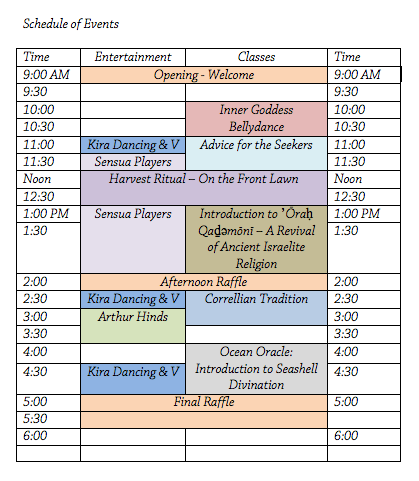 Kira Dancing and V will be doing demonstrations and performances at three times throughout the day. Classes will be taking place all day. Come early and stay all day for the fun and festivities!